The Smithsonian will celebrate and honor the 50th anniversary of one of the greatest achievements of human history with the traveling exhibition Destination Moon: The Apollo 11 Mission. Featuring the Apollo command module Columbia—the only portion of the historic spacecraft to return from that momentous mission—the exhibition will explore the birth of the American space program and the space race. 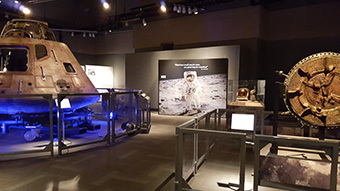 The Destination Moon exhibition tour is developed by the Smithsonian Institution Traveling Exhibition Service (SITES) and the National Air and Space Museum. This is a once-in-a-lifetime exhibition, featuring approximately 20 mission-related objects including the command module, Columbia. The exhibition will travel to select cities across the United States, before the objects return to a new, permanent gallery at the National Air and Space Museum on the Mall in Washington, D.C.
Photo: Destination Moon at the Saint Louis Science Center. Photo courtesy SITES.